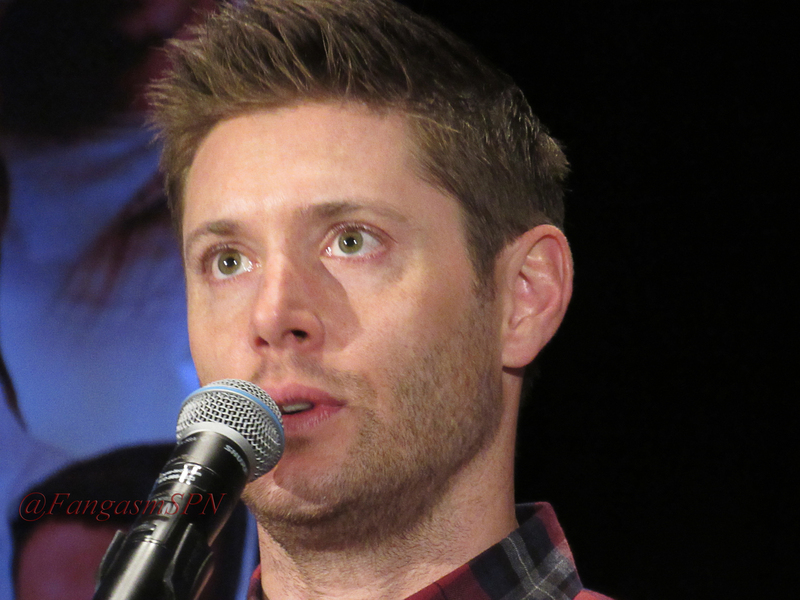 DallasCon Jensen Meet and Greet Tidbits – Countdown to S11! 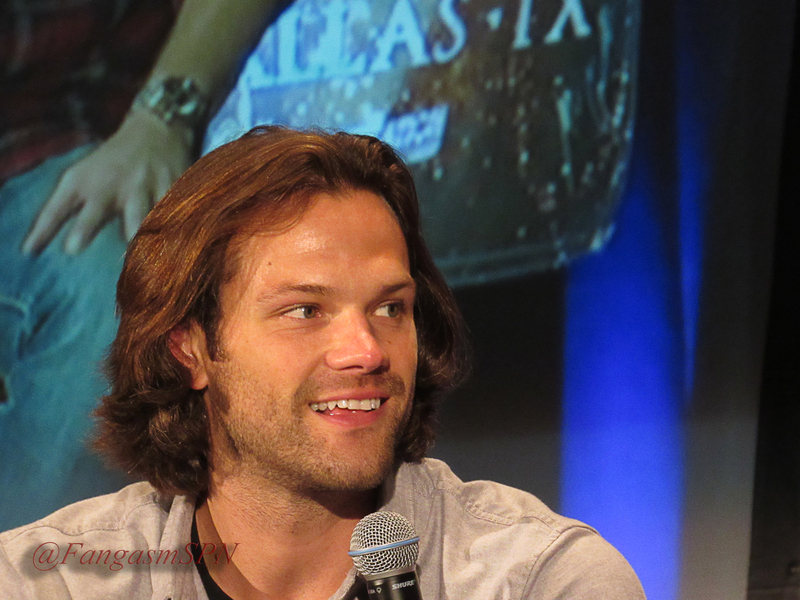 Other than being in a convention center with woefully long bathroom lines and a single food concession place, DallasCon was laid back and lots of fun. Some of my favorite fangirls were there to hang out with and the cast was in a great mood – Jensen and Jared got to spend time with their kids and families, many of whom were at the con, and Misha is all better and back to smiling a lot, which felt wonderful. 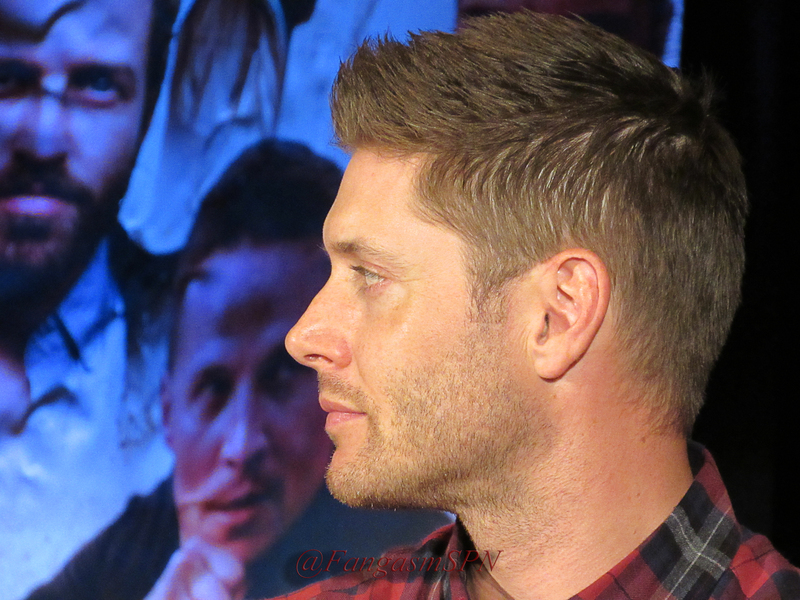 More photos and commentary from the con soon, but for now, here are some tidbits from Jensen’s meet and greet. Jensen: Danneel! Did you teach her to do that? But no. Apparently it’s all JJ. And who can blame her? Look at that faaaaaace! Of course he demonstrated this, and if the room hadn’t been so cold, we all would have melted. 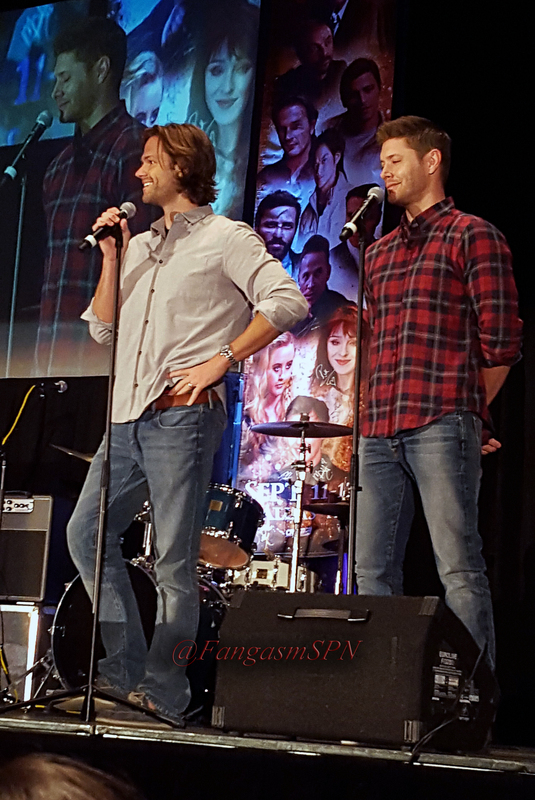 Okay, back to the Show… A fan said she loved the dvd commentaries that Jensen and Jared have done, and asked if there would be more. Jensen said they would like to do more, that it’s cool to go back and watch an episode even when it’s one of the old ones because you see things more objectively – and because all of those memories spark the nostalgia. (In other words, he watches old episodes just like we do!) So far WB hasn’t asked them to do more. Everyone: Hello?? WB?? Wake up. With the new season already well into filming and the teaser trailer for S11 having just been released, there were excellent Show questions. Since all we’ve seen of S11 so far is the trailer (which the cast clearly has a love/hate relationship with because it both gives things away and creates confusion and consternation in the fandom for perhaps no good reason), I asked Jensen a question about what we saw there. Jensen and Jared have both said that they’re excited about the new season because the brothers are back on track, back together, unafflicted by anything. But in the trailer, we see Sam bloody and tortured, and with ominous black veins bulging in his neck. That doesn’t exactly look like “unafflicted”! Jensen was careful not to be explicitly spoilery, but he did say that perhaps what we see in the trailer is not exactly what it seems. Me: So maybe what we see there is what happens in a one-off episode, instead of a whole season afficted!Sam arc? 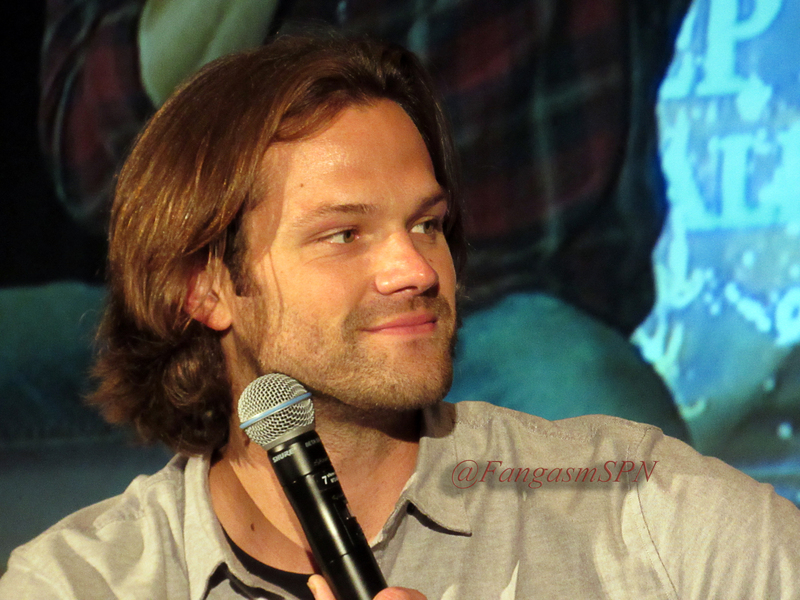 Jensen nodded, and reiterated what he’d said to me before, that we won’t be seeing Sam with an affliction. Maybe something is after Sam, but who’s to say it’s evil? Not to say that Sam necessarily lets Dean in on everything that happens. Me: (exasperatedly, thus sounding a bit like Rowena but without the awesome accent) Aahh! Winchesters! Jensen said again that this season feels to him very much like Season 1, with the Winchesters together up against this big thing that they don’t know how to fight and don’t have lore about, so in the meantime they’re going to get back to saving people, hunting things. Me: That’s actually like a brilliant re-set to Season 1. Tell Jeremy good job. Jensen: I know, kudos to Jeremy, I will. The Winchesters will also team up with some unlikely allies, which made me squee a bit hoping they’re some of my favorite guest stars. Someone asked if the Season premiere picks up where the finale left off. Jensen said yes, it’s a direct pick up — with a twist. We don’t know how much time has passed or what has happened during that time. Another good question was how Jensen approaches playing Dean’s development as a character when they shoot episodes out of order. Isn’t that confusing? Jensen said he focuses on the one script he’s working on, especially on how Dean comes into that story and how he exits. 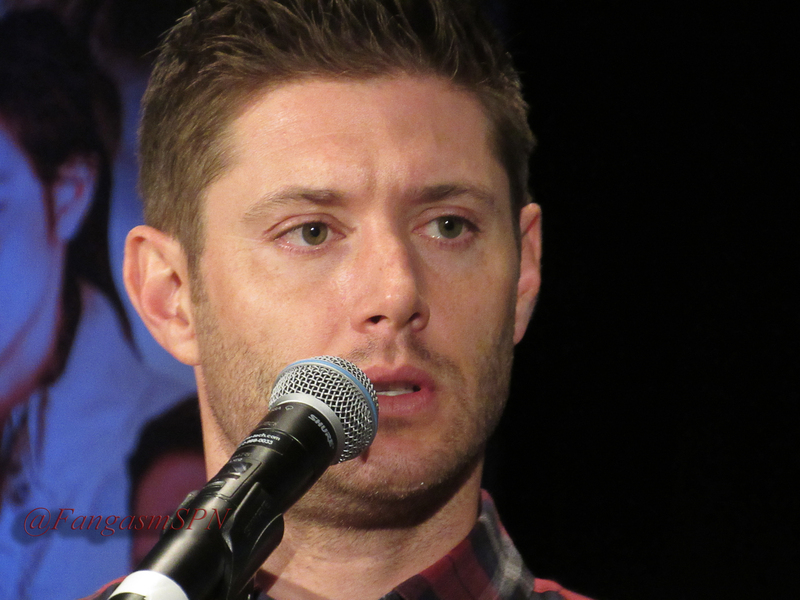 Jensen: Then I go from there. I keep them separate, compartmentalize the scripts. Jared does it differently, as one continuous story line. What’s important to him, he said, is going into it with an understanding of where the character is at emotionally. I’m always fascinated hearing actors talk about how they approach bringing a character to life. The emphasis on the emotional life of the character makes so much sense to me when I think about Dean, and how much emotion Jensen is able to convey in such subtle ways. Makes sense that he would prioritize emotional understanding of the character. He also said that shooting out of order is routine for them. 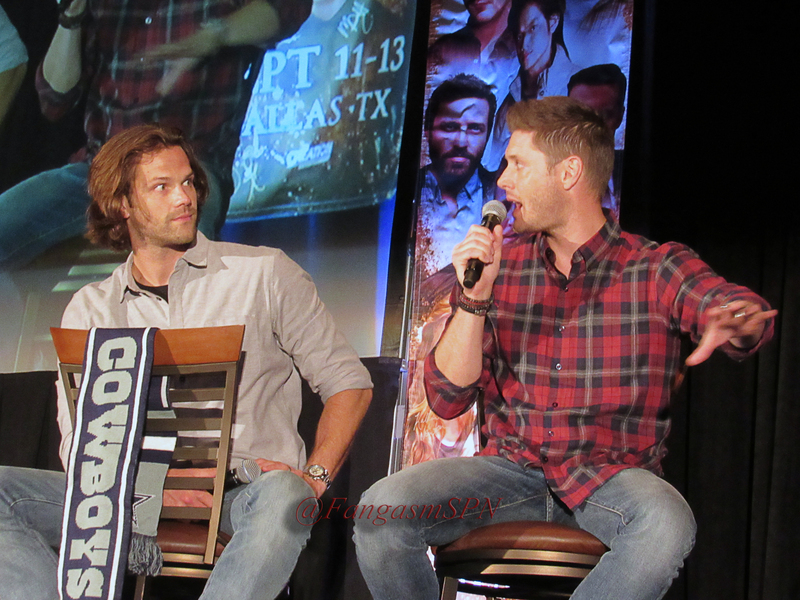 Jensen: We often shoot the scene where the brothers are talking…like in the car…you guys have a word for it, right? 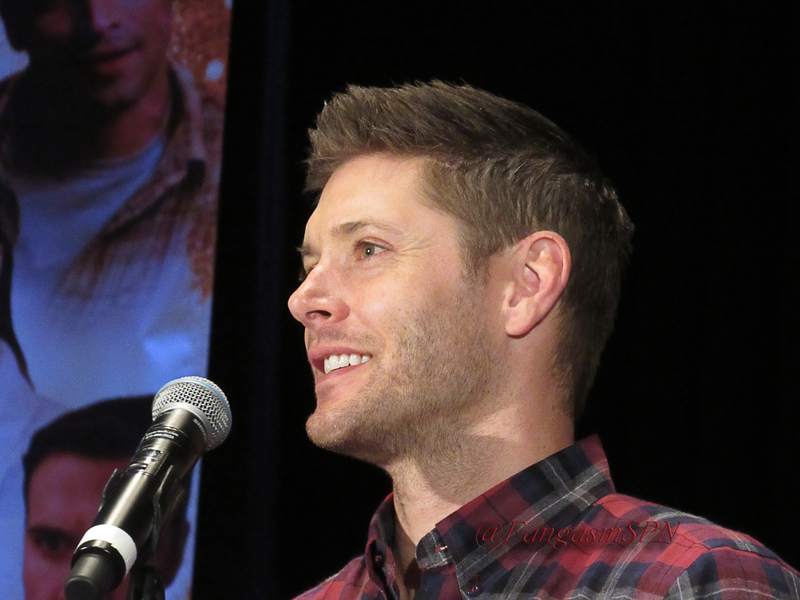 Jensen: (smiling) Yeah. We often shoot those scenes first. We shoot out of order all the time. A creative fan asked an interesting question that Jensen clearly had fun with. 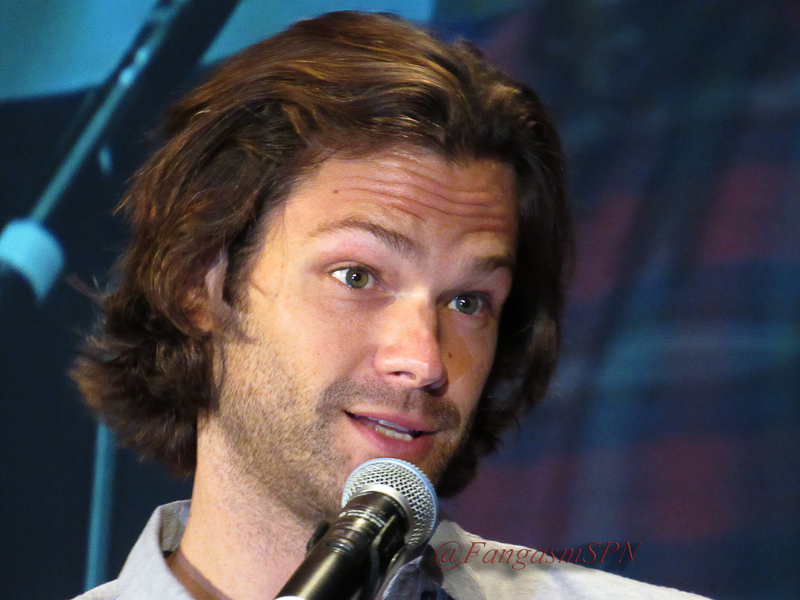 What character that he’s played would he like to see Jared play? 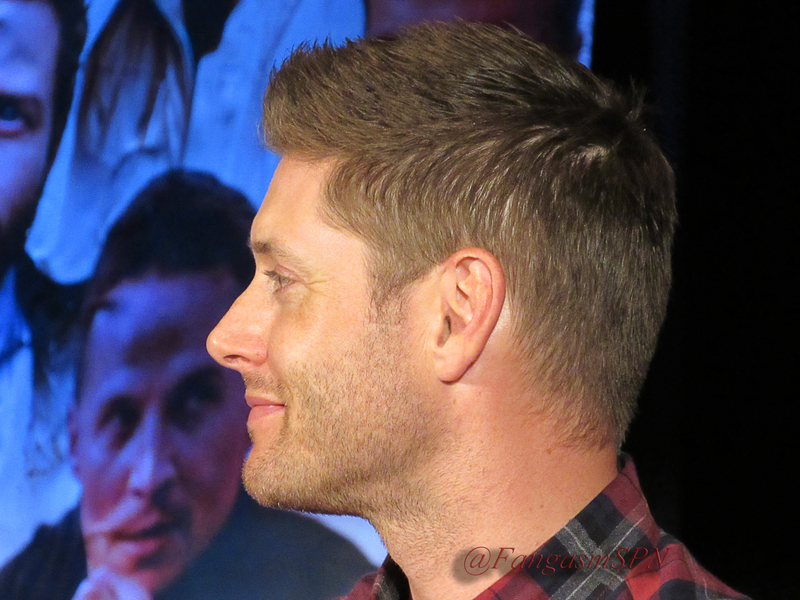 Jensen: (pondering, and then breaking out into an absolutely gleeful grin) Priestly. I’d love to see Jared do Priestly. Me: (forgetting my filter, because IMAGE!!) So would we! Jensen: All right, all right. Sorry, Jensen. But I mean, can’t you just see it?? 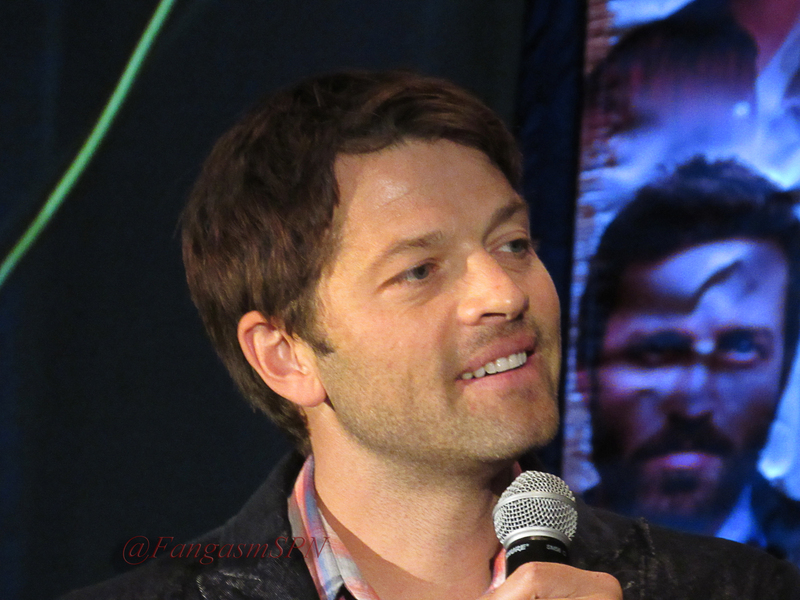 Misha was not spared either. Creative fan: And what character would you like to see Misha play? 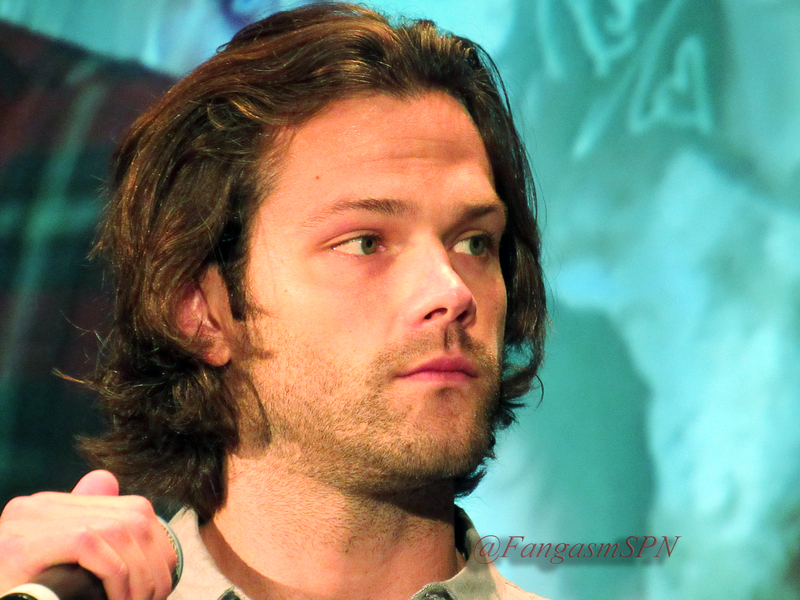 Creative fan: And which of Jared’s characters would you like to play? Jensen: Jared’s character in Friday the 13th. Because he got to ride an old Triumph. [laughing] Although he made it look like a mini bike! Of course he acted this out, so we were all laughing too. 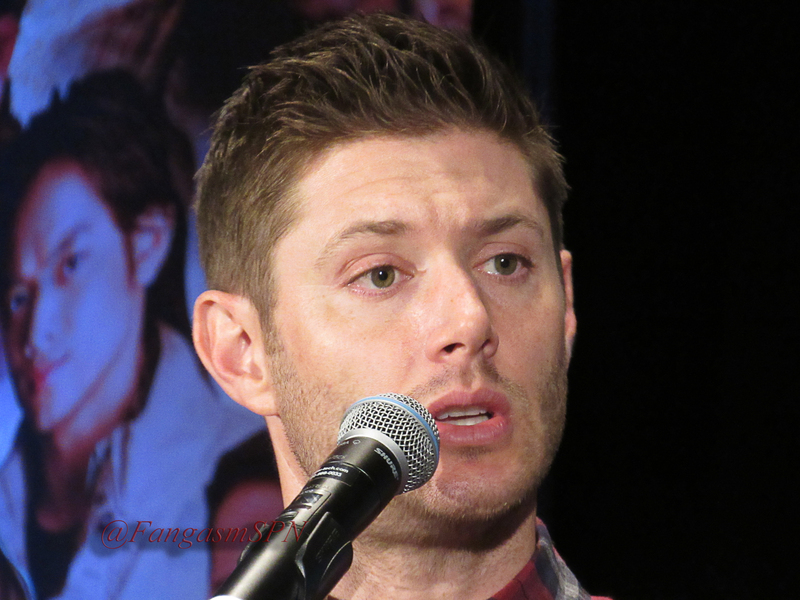 Another great question was when (what season, or what episode) Jensen felt like he really understood Dean. Jensen mentioned a few early episodes that helped him understand who Dean was — Phantom Traveler gave him an idea that Dean had a comedic side. And Dead in the Water solidified Dean as this kind of unsuspecting hero, someone who would run into a fire and not think twice about it. Jensen: Even though he can have kind of a hard exterior, there was this morally good heroic man underneath it. The scenes with Dad also gave him another clue about who Dean was, how he really looked up to his father and learned to do what he did. Jensen said that he didn’t know Dean then like he does now, though. Now he can read a script and say “Dean would not say that” or “Dean would not do that.” He wouldn’t walk into a room and stumble over dead bodies on the floor, or go “Aaah!” when he sees them. That’s not a way to get a “jump scare” that would work with Dean. Jensen: He’s seen 2000 dead bodies. Some of them his own! After playing the character for ten years, he knows this character inside and out. And it shows, I think. Near the end of the meet and greet, a fan asked the lovely and intrepid Jen from Creation to give Jensen some candy she’d brought for him. Jensen: Thanks! Jared got some before and I already broke into it and had some. Boys. I feel like I should hashtag that. On a more serious note, Jensen also talked a little about Richard Speight’s Supernatural directing debut, which is about to happen. Jensen: I’m actually a really big fan. I’ve been very impressed by the things he’s done that I’ve seen. He said the script is very unique. 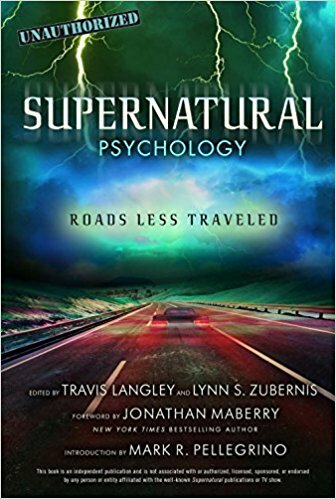 It’s written by Jenny Klein, who is good friends with Ben Edlund (who I still miss like crazy!) and that this script seemed very “Ben-like”. Which makes me even more excited for Richard’s debut episode! Jensen also said that Richard has the entire crew and all the actors on his side. They will undoubtedly prank him unmercifully, but I think we all know they’ll give him 110% and all the help he needs. Later, we asked Jensen if he’s given Richard any advice about directing. Me: Maybe the advice you should give him is watch your back! Jensen laughed, but it’s probably good advice for Richard. I can’t wait to see that episode – and ALL the episodes, starting on October 7th. I’m so ready!!! Click the links at the top of the page for more info! ← Jensen, Jared and Misha at Vancon! It’s such a joy to read these! Thanks for writing them up so fast. Also, I thoroughly approve of your new camera! You are taking outstanding pics these days! Lynn, what camera did you buy? Your pictures are fantastic! Thank you again! Lovely report. Jared in a kilt. Why do I feel like it would look like a mini skirt? Probably wouldn’t be too hard to talk him into it. He seems pretty game for anything! Lol. So, I almost didn’t read the whole thing because of the “spoilers” section at the front sent my mind spinning and I just want to give my interpretation of the trailer. They aren’t afflicted by anything, its the darkness that is within them, the memories that we’re seeing, from Sam’s time in hell, possibly Dean’s time in hell or purgatory. Their first task will be escaping their own darkness, that THE darkness has resurrected in their minds. At least, that’s my take on it, I really didn’t see either of them being affected by anything. I’m extremely curious to see what Crowley unlocks in Cas’s head, after all, he’s the only one that knows how to hack an angel. I don’t think your job is ever easy when it comes to my photos – but you do a kickass job! Ooooh, and I just cannot wait for S11!!! Great questions were asked! Thanks for the write up! They really were great questions – and answers! You’re very welcome, thanks for commenting! Another great piece! Thanks for sharing, Lynn! Info about the show is always welcome…but to get to know some of our favorite people just a little bit more is such a treasured pleasure! Thanks for the recap. I was sitting there also and found my self just drowning in his every word and looking at that beautiful face so close to us all and actually forgot I had a few questions to ask and never raised a hand. It is all good though because good questions were asked and the JJ comments were just precious. Thanks again Lynn for a great write up and love your pics as always. I didn’t go gold this time and my photos lack the head on view so I enjoy those that were lucky enough to get the great shots. I am using a new camera also and still getting the feel for it but got some pretty good ones in spite of the angle. So glad you had a good time too! (It would be difficult not to, I suspect 🙂 I thought the questions were great this time, which made for some great answers! I absolutely love your recaps. They truly give us the sense of intimacy of M&Gs without simply recalling verbatim. 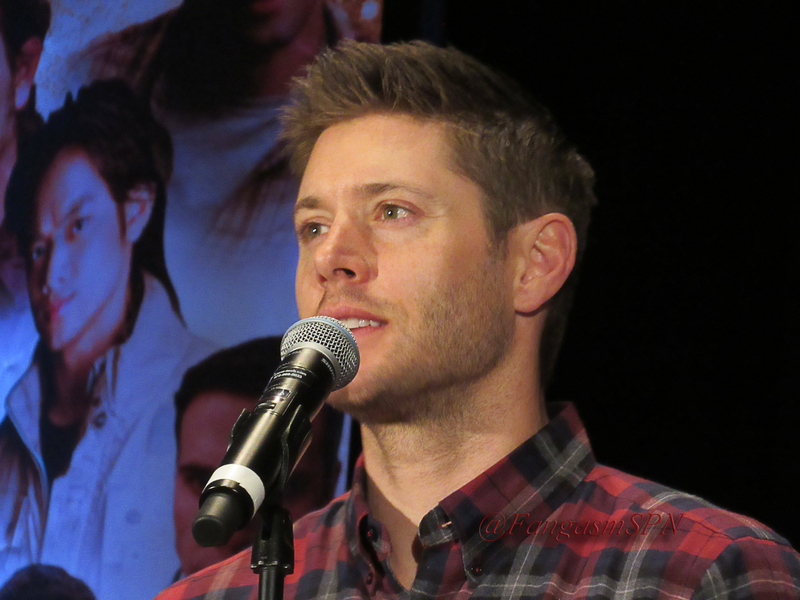 You are able to convey how relaxed Jensen is compared to his sometimes reserved stage presence. Thank you again for all the work you do for the fandom. I can’t wait to see you again at PasCon. BTW, when do we get to see the new book y’all are working on? I’m dying from anticipation! Thanks for the write up!I’d love to go to a con myself some day but in the meantime, you really make me feel like I’m actually there. Jensen always gives such thoughtful responses to fan questions. Such a terrific JJ story, happy sigh. And I’m really excited about what’s coming up for the boys in season 11! Sounds like there’s some interesting stuff for Sam, from what we saw in the trailer, his visions, and the spoiler about something seeking him out. 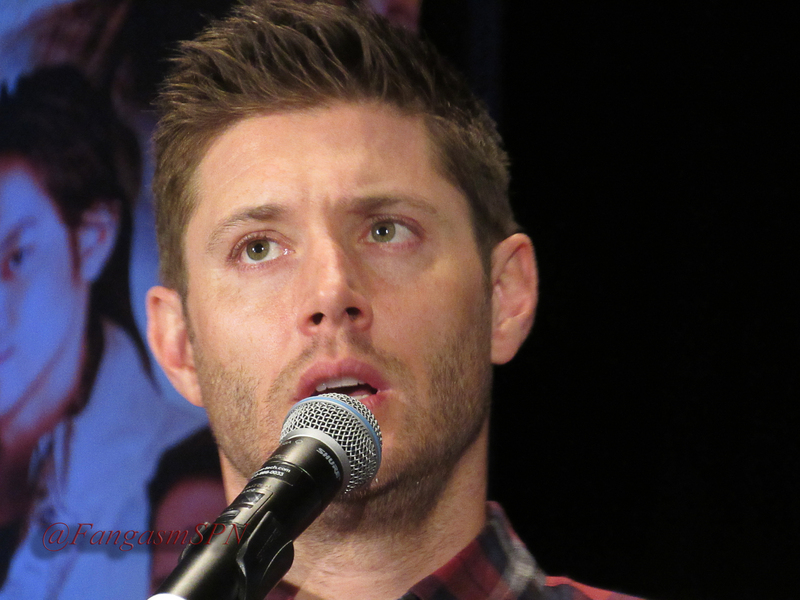 I’m kind of disappointed Jensen hasn’t really had anything to say about Dean, though. Fingers crossed that maybe he’ll have some Dean-related tidbits in one of his upcoming meet and greets. Once again, many thanks – you Fangasm ladies are awesome! I hope we get more than protective, sidelined Dean like we did in the last half of season 8. Even Jensen said Dean was a “cheerleader” then and I hope he gets more of a storyline than that, he is one of only two co-leads in this show. Thanks so much. I always look forward to your blogs about cons and you never disappoint. Did anyone ask Jensen about a storyline for the character he plays? It would be nice to know that Dean has an individual arc like Sam, Castiel and Crowley have. Me too 🙂 And you’re welcome! Thank you for this write-up. 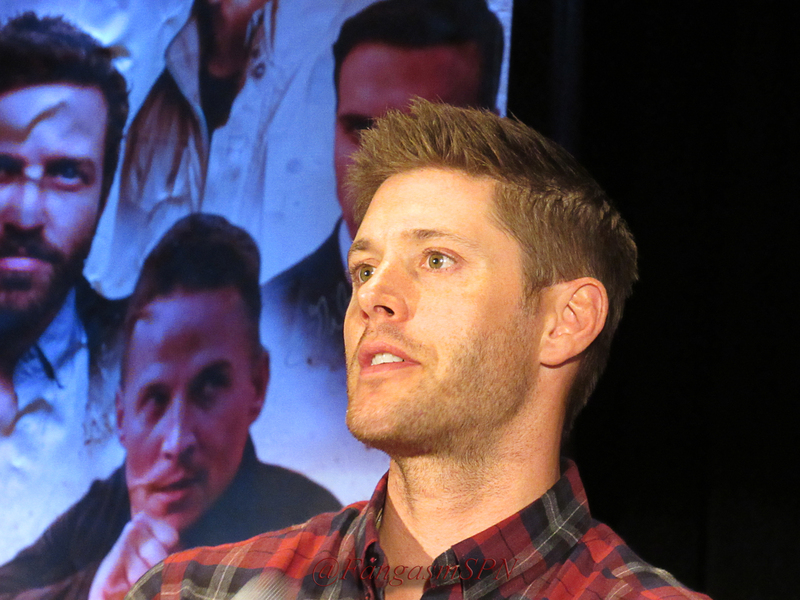 I love hearing Jensen’s responses, he gives great insight and thoughtful responses. We will only hear about Dean’s individual storyline, if there even is one (and based on the spoilers we’ve got so far, I don’t know Dean will get a storyline), if those attending Jensen’s meet and greet ask Jensen questions about it. I hope at upcoming cons, the people attending Jensen’s meet and greet actually ask questions about Dean and Jensen and not about other characters and other actors. Nice review of the Con and Meet & Greets. You always do a great job of summarizing and hitting the high points! Wish you were coming to Denver!